After months with record-low activity, the 2013 tornado season roared back with a vengeance on Wednesday as at least 10 twisters touched down across portions of north-central Texas, killing at least 6 and injuring dozens more. An even broader outbreak of severe weather, including the threat of more tornadoes, is forecast this weekend from North Texas to Missouri, gradually shifting eastward with time. Eyewitness video of one of the Texas tornadoes on Wednesday. There were reports that the Granbury tornado was as large as 1-mile wide, and aerial footage on Thursday morning revealed a broad swath of destruction. The town received a tornado warning 20 minutes in advance, according to Reuters. Preliminary reports from the National Weather Service show the tornado was at least an EF-4 on the Enhanced Fujita Scale, with winds of between 166 to 200 mph. Damage surveys have found homes that were completely swiped aside, and reduced to mere concrete slabs. The Texas tornado fatalities were the second in the Lone Star State since 2007 — an unusually long stretch for a state that typically sees 8 deaths per year, based on statistics from 1961-1990. For the U.S., the deadly outbreak shatters the relative calm of the 2013 tornado season, which was following an apparent record in 2012 for the fewest tornadoes during any 12-month period, dating back to 1954. But the country is just two years removed from one of the deadliest and busiest tornado seasons on record. 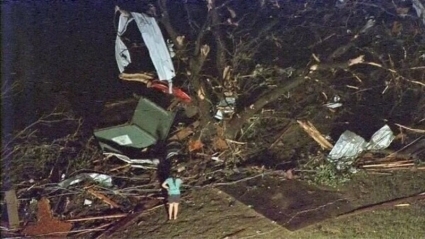 Aerial image of the damage near Granbury, Texas on Wednesday night. Credit: Twitter via Kristin Walls. The National Severe Storms Laboratory (NSSL) in Norman, Okla., estimated that between May 2012 and April 2013, there were just 197 tornadoes ranked EF-1 or stronger. That tops the previous 12-month low of 247 tornadoes from June 1991 and May 1992. Tornado researcher Harold Brooks wrote on NSSL’s blog that the death toll from tornadoes during the past 12 months was also flirting with a record low, with seven tornado fatalities during that period. That's the lowest 12-month tornado death toll on record dating to 1950, but research has shown that the 12-month period starting in September 1899 may have been even quieter, with five fatalities. The U.S. did set a record for the longest streak of days without a tornado-related fatality — at 220 days — between June 24, 2012 and Jan. 26, 2013. And July 2012, which was the hottest month on record in the U.S., saw the fewest tornadoes on record for any July. Doppler Radar image showing the classic “hook echo” signature of the Granbury tornado. The severe drought that has gripped much of the U.S. for more than a year was the most likely leading cause of the plunge in tornado activity, since it helped squelch thunderstorms by robbing the atmosphere of necessary moisture. In addition, this spring, a persistent dip, or trough, in the jet stream across the West, Midwest, and South Central states has also inhibited widespread severe thunderstorm activity, instead resulting in record cold and record-breaking spring snowfall. April 2013 contrasted sharply with April 2011, which set the record for the most tornadoes of any month on record, with 358. The weather pattern then, though, consisted of a westerly air flow across the U.S., with low-pressure systems that brought slow-moving cold fronts that collided with warm, moist air from the Gulf of Mexico, yielding major severe weather outbreaks. Now that weather patterns are changing, with the drought shifting to encompass mainly the Western U.S., and the unusually cold air retreating back to the north, severe weather in the Plains and Midwest is becoming more likely, forecasters said. The U.S. may see more tornadoes this weekend as a storm system draws moisture north from the Gulf of Mexico, where it will meet a cold front with an energetic jet stream aloft. These jet stream winds will help give the thunderstorms a key ingredient necessary for tornadoes to form — wind shear — which occurs when winds blow in different directions with height. So far, there’s simply not enough information to say anything definitive about the future of tornadoes under climate change. Studies of how the environment that gives rise to severe thunderstorms and tornadoes may change as global warming continues shows that the number of thunderstorm days may increase in parts of the U.S. — owing to an upward trend in heat and humidity — but wind shear may decrease, which could curtail tornado numbers. What the 2013 Tornado Season Has in Store for the U.S.